I’m not new to Smithsonian’s online exhibit and I did a brief review of their exhibit Cover Art a few weeks ago. 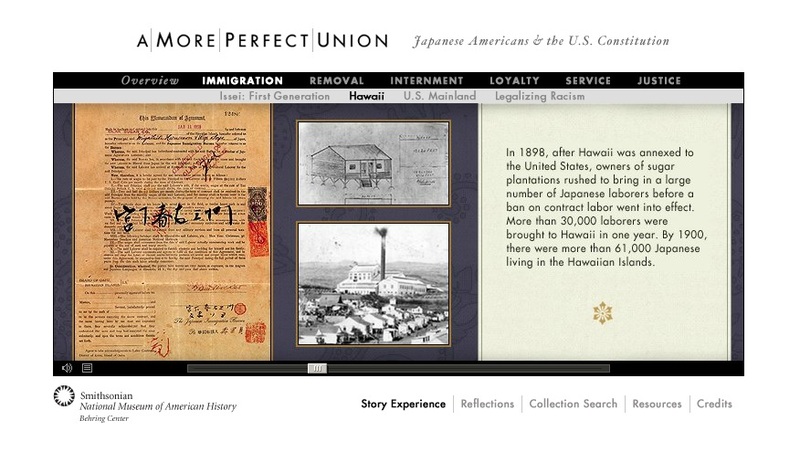 This week I checked out a older online exhibit from Smithsonian Institute titled A More Perfect Union: Japanese Americans & U.S. Constitution. I chose this exhibit because since the beginning of my college career I have been interested in immigration to the United States. I’ve typically been interested in Latino immigration to the US in the 20th century (particularly Mexican) and Chinese immigration in the 19th and 20th centuries. I was interested in how A More Perfect Union to see how it dealt with the less than positive or comfortable experiences of Japanese immigrants. The exhibit originally toured from 1995 – 1998 but made a return because the institute felt that after the September 11th attacks that the story still had resonance, and that is absolutely true. The online exhibit roughly covers the period from 1900 to 1980 and covers the experiences farming, forming communities, businesses, racism/xenophobia, removal to internment camps, and the aftermath. The exhibit is focused on how informal prejudice became institutionalized racism. It is a touchy subject that hasn’t always been something that Japanese Americans themselves have wanted to discuss. The overall exhibit provides a well rounded breadth of featured artifacts which users can click on and see larger with description. The overall exhibit has a soundtrack that I eventually turned off because I found it a little irritating but I can understand how it could be used to create atmosphere (important considering this is an online exhibit). I enjoyed the audio clips that you could listen to for introductory text and the oral history accounts which literally allow for people to speak for themselves. There is a need for a few adjustments and a more updated appearance. My first issue was the visual size of the exhibit, the presentation does into take up the whole web page space which makes the images and text a bit small. I do enjoy the ability for the user to decide on their own pace and could choose what subject to explore. Otherwise, A More Perfect Union has a predetermined path for visitors. I enjoyed enlarging photos of artifacts but I would suggest that the accompanying text provide more context on how some artifacts are connected to the subject. For instance, there are advertisements from fruit companies and a person would have to assume these were companies that many Japanese immigrants worked for. A bit more context and visual updating could help with this exhibit that I think discusses a facet of immigration to the US that doesn’t get as much coverage some other immigration experiences (for example: Italian, Irish, etc.). I would love to see the exhibit refashioned while still featuring many of the intriguing artifacts and stories. It would also be nice to be able to hear more oral testimonies. My final praise for the exhibit is the provided space for visitors to provide reflections and personal stories; this is one of the most valuable contributions of the site. This site is most appropriate for any visitor age 12+ and it would also be great for use in educational settings. This week I am enjoying my brief spring break. While I might be taking a short break from school that doesn’t mean that I’ve taken a break from history. Here are three history-based interests that I’ve been interested in this week. Recently, while doing a job search (scary! ), I happened across the Smithsonian’s National Portrait Gallery website. They now have an exhibit American Cool, which runs from February 7 to September 7, 2014, which chronicles the origins and generational changes in the concept of being “cool” through the medium of portraiture. You may say: “What does the Smithsonian know about ‘cool’?” But I think they have a concise definition on their website: “To be cool means to exude the aura of something new and uncontainable. Cool is the opposite of innocence or virtue. Someone cool has a charismatic edge and a dark side. Cool is an earned form of individuality.” Seems like a….”cool” definition. The exhibition features portraits of Americans from Frederick Douglass to Fred Astaire, Billie Holiday to Marvin Gaye, Debbie Harry, and Prince. The full exhibition list mostly includes entertainers and a racially mixed grouping (the list has a hefty amount of portraits of African Americans and Bruce Lee is the exhibit’s only Asian person in the group). This is exciting, right? Each set of portraits is arranged by generation and I’m sure docent-led tours would provide a great learning experience. Oh and just in case you don’t think two curators got the exhibit of 100 coolest Americans right there is also alternate list and a comment book at the exhibit. I think I will have to get myself to Washington D.C. this summer. Check out the website’s page here. Until I can make it to the National Portrait Gallery, I also noticed an online exhibit they have that features Time magazine covers with selections spanning from 1923 to the 1970s. In 1978, Time donated 800 pieces of cover art to the National Portrait Gallery and now the collection has expanded to 2,000 pieces. Cover Art focuses on some of the notable personalities and artwork featured by the magazine. I enjoyed the straightforward and visually stimulating presentation. The online exhibit has an introduction and after that viewers can pick cover artwork to learn more about. Some selections even have audio to accompany interpretation including the cover art depecting Marie Callas, Albert Einstein, and Martin Luther King Jr. If viewers are looking for a thematic grouping of images Cover Art features five themes such as “Man of the Year” (which does feature or discuss two notable female exceptions) and “Civil Rights”. Check it out here. Ok, there is more than two history-based things I’ve been looking at this spring break. Call it a guilty pleasure but I don’t feel guilty. I am obsessed and deeply invested in the History Channel series Vikings . Yes, I know there are many historians’ critiques of History Channel (or just “History” as they call themselves today) and their abandonment of history content on television. I agree with those critiques especially as someone raised on their earlier days of history documentaries. History does however sponsor history related institutions and organizations. Vikings is about the legendary Ragnar Lothbrook, his wife shield maiden Lagertha, and his fictional brother Rollo and a few other main characters. I know Vikings has its own historical inaccuracies and I simply don’t care. Yep, I said it. Unfortunately, the intricacies of history cannot be totally recreated on television or film, heck historians can’t recreate the past. That being said, the show seems to be a entertaining effort but I’m no Scandinavian history expert. However, I do think that the show is attempting to depict the Viking people in a different and more realistic way while also accommodating some audience expectations of Vikings as well as incorporating Norse sagas or epics. That’s a job and a half. The show is also trying to explore Norse religion and Christianity of the period. I appreciate the magic realism, Travis Fimmel’s blue eyes, and the character Lagertha’s awesomeness. Give it a try. Feel free to share in my spring break history geek moments.